Christmas show! Also, local musician Josh Whalen joins in studio to perform his original song "Sick Cycle,"
and tell an amusing bike riding story. 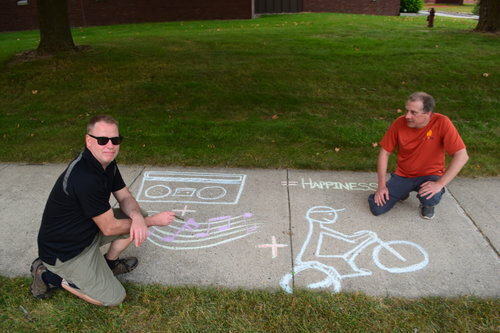 to tell some bike riding stories and play music. Second annual Black Friday Show. joins in studio for an interview and a surprising twist from the Bike Rides show. Dan's lovely niece, Emily, joins Hank and Dan in studio to play some music and games. but could be interpreted as such. Hank and Dan back in the saddle this week. Dan plays a 'fall' set and Hank talks about meeting firemen. to play live in studio and talk a little music/bike riding. Guilty pleasures show: Songs this week that no one wants to admit they like. Dan picks a Jewel gem and Hank's confesses to being a closet Abba fan, among others. Hank joins Dan in mid-show to play some Tom Waits. Dan tells another funny bike riding story about Hank before he gets to the studio. and stays weird until Rod Stewart normalizes things at the end. Just your run of the mill Bike Rides Radio Show with Hank and Dan. Martin Zellar and Nick Ciola cruise into the Bike Rides studio for a delightful hour of music and musings. Dan rides solo and plays more Austin Art Works related songs. and Hank performs an in studio drum solo. talks a little about the forthcoming event. Dan rides solo again, except for you... Thanks for riding along. Dan rides solo, playing delightful music and playing games. Plus there's an embarrassing bike riding story this week. and delights us with her charm and a tune of her own. Dan goes solo but tells a funny story about Hank. Bella Ruse visits in studio to play live and grace us with an advance copy of their new CD Those Were Good Times, Weren't they? Also, a surprise visit from John Keats and a twisted cameo from The Captain and Tennille. Six Mile Grove starts and ends the show in support of Austin's Summer Destination concert Friday night. In between we play two in a row from several sets of artists "Then and now." Hank and Dan play a Memorial Day set along with a set of "running" themed songs. Hank and I together just do your average Bike Rides Radio Show. The second annual Darren Dash show featuring Darren's sister, Dana Kvam. of Pink Floyd's infamous "Wall" album. Dark Side Of The Moon show in Rochester and play a live set. This week Bike Rides hijacks Rush Limbaugh's theme song that he hijacked from the Pretenders. Later Hank and Dan discuss Kim the child dictator. and play some related music. Dan is sick and rides solo this week, playing a moon song set plus some interesting armature cuts. The Goosetown Roller Girls wheel into the studio from New Ulm, MN to talk a little Roller Derby and play some appropriate (and some inappropriate) songs. This show is a MUST hear! Hank picks some Fleetwood Mac, Dan discovers the best "break up" song ever. Click here to see the video for the dB's "Amplifier". Dan reads a column on painting the town pink, Hank picks a Tom Waits song. Sena and Ed Ehrhardt join in studio to promote their sophomore release on Blind Pig Records titled "Al In" plus the guests share some funny bike riding stories of their own. You've GOT to hear Ed play and Sena sing in studio, frankly it's MESMERIZING!! Hank demonstrates his singing voice (briefly) under upper respiratory stress. among other topics and brings some great music too!